If I saw pictures of our Bishop being honoured at a local Masonic event, I would be going ballistic right now. Rorate Caeli reported that Brazillian Bishop, Luiz Demetrio Valentini of the Diocese of Jales, went on April 10th to the Masonic Lodge "Colonel Balthazar" in Jales, in honor of its 53rd anniversary. 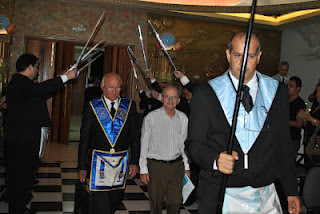 Here is His Lordship being welcomed into the Lodge. Why is everyone in 'clerical dress' except His Lordship, I wonder? It couldn't be, could it, that involvement with Freemasons diminishes Catholic truth, Catholic belief and Catholic identity? All very odd and more than a little concerning. Hopefully, the involvement of Bishops with Masonic lodges is confined to the Diocese of Jales. I get the feeling the Archbishop isn't at the Lodge to convert the Masons to the Catholic Faith!! Oh! I'm not happy about this at all. I have seen the involvement of "Catholic" friends in local lodges and I haven't liked what I've seen. I would call it a compromise of faith. I'm sure "The Bones" is well aware that we're not talking about the nice handouts to the Rotary Club charities here. I don't believe any Catholic - or Christian - bishop should accept an honour from any order of freemasons: I simple don't believe they are in any position to bestow it. Thanks for posting. Interesting that this is about Brazil. I have a post on my blog 'Reiki & Christianity; Why the two are incompatible' about Father Leonard, an Irish priest who is now in Brazil. Not only does Father Leonard practise reiki himself, but he has written a book called 'Reki for Christians' which has a forward written by a Brazilian bishop who is apparently knows the current pope well. I suspect dementia. The poor man doesn't know where he is. Look: he can't even dress himself properly. The Discovery of Oz, the Terrible!